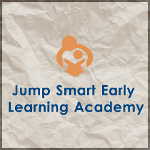 Dive into early childhood education with the Jump Smart Early Learning Academy of Chicago, Illinois. We offer a unique, play-based preschool program, because we believe children learn best through play. We feel that learning social skills is the foundation for academic success, and we design our preschool curriculum and activities around this principle. When the children arrive they are allowed to make choices on visiting morning centers or selecting activites. Activites range from blocks, dramatic or reading areas, sensory play or table games. The morning program continues with small group and individualized instruction designed based on each childs learning style. Our curriclum is created to meet the needs socially and academicallyof our children. We use a variety of teaching strategies that help children develop problem solving and reasoning skills. Our field trips are both fun and educational and contribute to the overall success of our program. We offer beginner’s Spanish every September to parents that are interested in their child learning a second language. Mr. Alvarez teaches Spanish vocabulary through music, games and movement. Research has shown that incorporating games and music while practicing a foreign language actually helps children master language quicker. Learning a second language not only exposes your child to another culture but gives them a bigger view of the world. Our teachers understand that we all learn differently therefore, we incorporate many teaching methods that appeal to the different learning styles of our children. The project approach is one of the methods we use because it follows the children's interests and encourages exploration and critical thinking. The teacher becomes the facilator, observing and motivating each child to think freely without the fear of criticism. There are many opportuties for collaborations and small group work with peers. Project work helps children practice new skills, such as observational drawings, asking questions, jornaling. and learning new vocabulary. This is rewarding for children because it builds confidence and creates an environment for learning, while participating in activities that are meaningful and help children learn about their world. We are excited to announce we are a Nature Certified Classroom through Nature Explorer. Our mission is to help educate children using research-based principles integrating nature into their daily lives. The lessons and activities we incorporate provide opportunities for children to develop creativity, problem-solving skills, stimulate cognition and improve readiness skills. The best part about nature classrooms is it allows children to take control of their own learning by investigating topics they want to learn about. All we do is provide an environment for exploration and they do the rest..
Parents are excited as the children to hold newly hatched baby chicks! Contact us with any questions regarding the activities and lessons in our program.